Move over, graphene and carbyne stanene, with 100% electrical efficiency at temperatures up to 100 degrees Celsius (212F), is here, and it wants to replace the crummy, high-resistance copper wires that are a big limiting factor in current computer chips. Where graphene is a single-atom-thick layer of carbon, stanene is a single-atom-thick layer of tin. Modern computer chips, such as Intel’s Haswell or Apple A7 SoC, have over one billion transistors. Just think about that for a moment we’re talking about a piece of silicon that’s around the same size as your thumbnail, and yet there are one billion little switches in there. If that wasn’t crazy enough, each of these transistors has to be connected up, via tiny copper wires, to form an actual logic device. 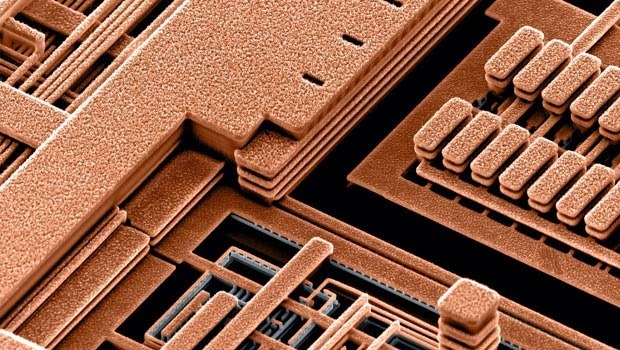 In a modern chip, there can be more than 60 miles (100 kilometers) of copper wiring 60 miles of wire, in a piece of silicon the size of your thumbnail. Now, copper is pretty darn good when it comes to electrical conductivity, but when you get to the point where connecting wires are just a few atoms across, things start to get complex. Not only are copper wires very fragile (they snap), but as they get thinner and thinner, quantum physics takes over from classical physics and throws a spanner in the works. Stanene, which gets its name from the Latin name for tin (stannum), is a theorized material fabricated from a single layer of tin atoms. Unlike graphene, which is just stupendously conductive, researchers at Stanford and the SLAC National Accelerator Laboratory say that stanene should be a topological insulator. Topological insulators, due to their arrangement of electrons/nuclei, are insulators on their interior, but conductive along their edge and/or surface. According to the Stanford and SLAC researchers, when a topological insulator is just a single atom thick such as stanene the edges can conduct electricity with 100% efficiency. 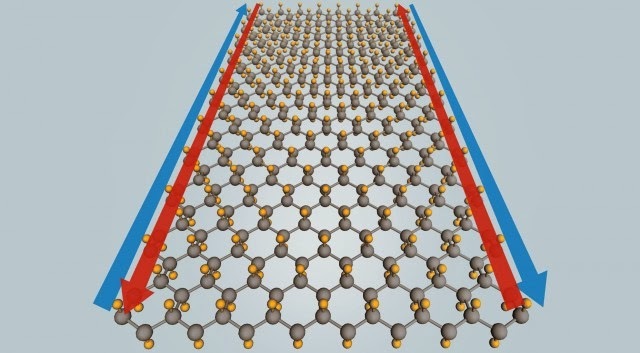 The Stanford and SLAC researchers say that stanene (which hasn’t actually been fabricated yet) should have 100% efficiency edges at room temperature but more importantly, by adding a bit of fluorine (the yellow atoms in the picture at the top of the story), the 100% efficiency can be retained at operating temperatures up to 100 degrees Celsius. This is very important if stanene is ever to be used in computer chips, which have operational temps between 40 and 90 C.
We’re not entirely sure how the researchers reached the outlandish claim of 100% efficiency (which we’re pretty sure is technically impossible), but perhaps they’re just using “100%” to mean “near-perfect efficiency,” which is certainly possible if you straddle the classical-quantum physics divide. There’s no word on when stanene will be fabricated for the first time. It probably won’t be very hard to fashion stanene on a small scale, using scanning tunneling microscopes and other non-scalable techniques. It will likely be a very, very long time until stanene is used in the production of computer chips. Now read: Will 2-D tin be the next super material?